When most people are thinking about custom cakes online or birthday cakes to order or for delivery, several TV shows come to mind. Ace of Cakes, Cake Wars, Cake Boss…all these shows that feature custom cakes that you once thought would be impossible but end up getting made as cakes. 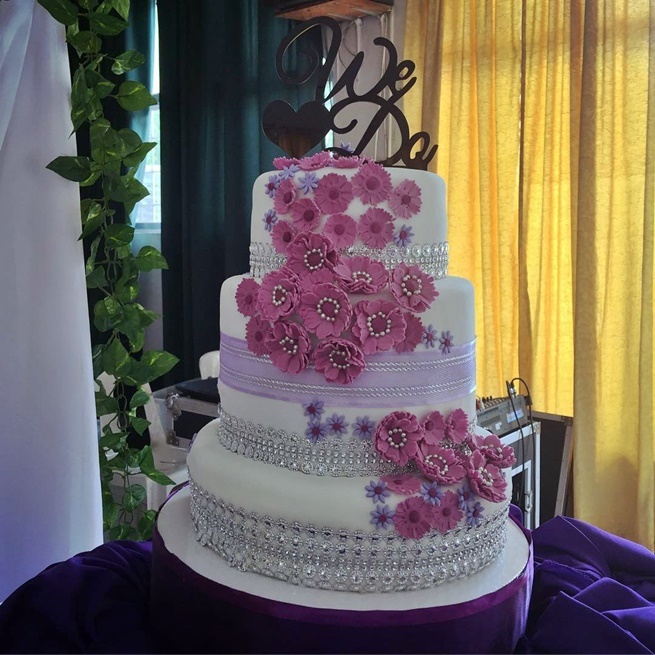 For me, when I think about custom cakes, I think about my cousin Karen, who has her business called Karenina’s Cakes. I still remember the day when she mentioned that she wanted to take baking classes and that she was enrolling in a TESDA course for it. I even remember the time when she mentioned that she was about to finish the class and they were having their finals, doing some sort of demo or exhibit at a mall to show off their work. That seems just like yesterday and now, she has become such an amazing baker/cake designer and she just blows me away with the work that she does. If anyone ever thought that you needed to go to a fancy baking school to become an amazing custom cake maker, my cousin would make you think you thought wrong. TESDA did a good job teaching her and guiding her to do her thing. Every time she brings a cake that she’s done to our family gatherings, it’s something that is sure to be a hit with everyone. Her cakes seem to get better every time she brings them and from the looks of her social media accounts that feature the cakes that she makes for her customers, practice makes perfect. Her cakes just keep getting better and better. She makes cupcakes with her cakes too! These days, she’s very busy designing custom cakes and delivering these cakes to customers who can be from as far as Quezon City (my cousin is from the South) who are more than willing to pay a little extra just so she could be the one to make their cakes. She’s even been featured on several websites about good custom cakes. She has even made some for a couple of celebrities (ordered for them by their family and friends). 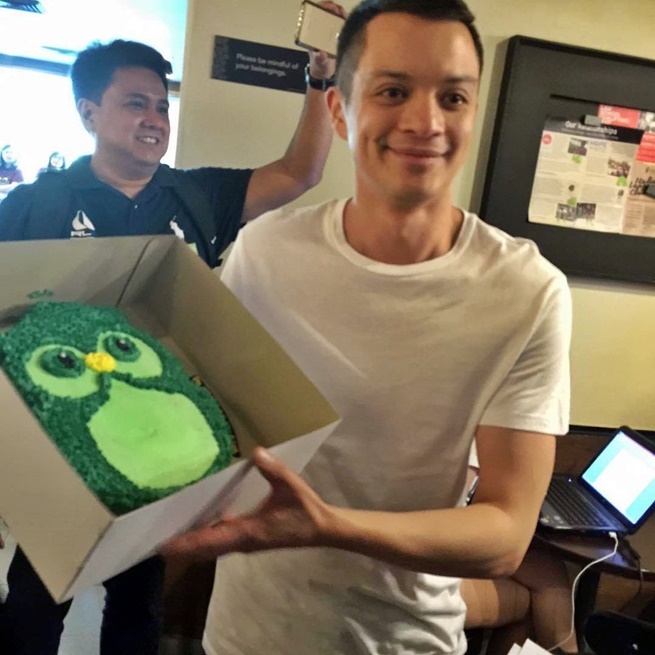 Even Bamboo has received a Karenina's Cake! I am so proud of her – and so happy that there is someone who will one day make me an amazing birthday (or, if it will ever happen, wedding) cake with a design that will make me wish that I don’t have to eat it (because her cakes are not just creative and artistic, they taste good too). Her cakes just look too good to have to slice up and eat (but when you do, there are no regrets). The thing that makes her cakes amazing is that she can make so many different and creative designs depending on the occasion. 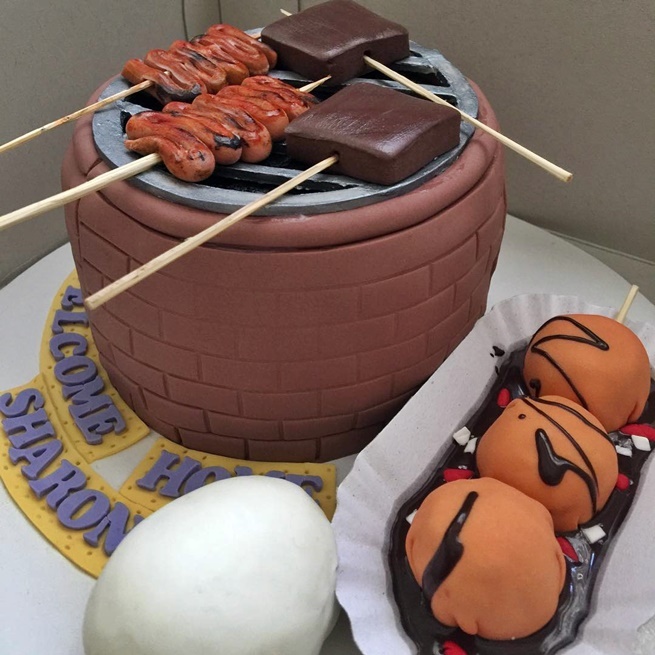 Her street food cake was featured online because it was unique and looks realistic (and except for the sticks, they are all edible if I am not mistaken). 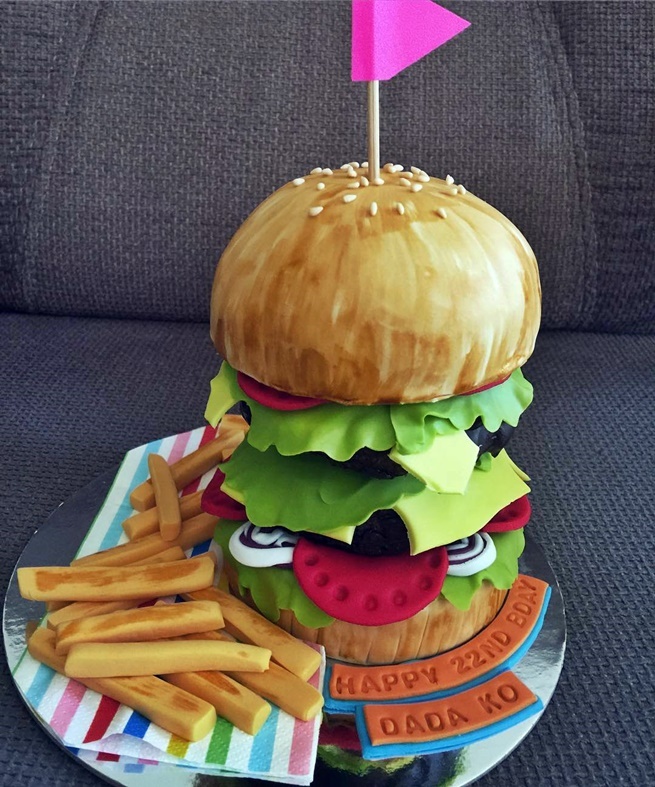 She even made a hamburger cake and it looks like the real deal too! Whenever I watch those custom cake shows on TV I am always disappointed with how for the most part, the decorative parts of their cakes are non-edible. You see them constructing things with wood, wire and cardboard then covering them up with icing or fondant and passing it off as a cake. Only the base is the cake most of the time in these shows. That’s probably the reason why I love my cousin’s cakes because you can eat the decorative parts too. Don’t let the photos I posted here fool you – my cousin Karen also makes cakes that do not have fondant or all those fancy decorations. She makes good normal cakes with the icing and everything (those are the types of cakes she brings when we get together). Personally, as much as I admire the fondant-decorated cakes and cupcakes that she makes, I love it when she gets creative with cakes that involve just icing (and sometimes bits and pieces of chocolates and other candy). 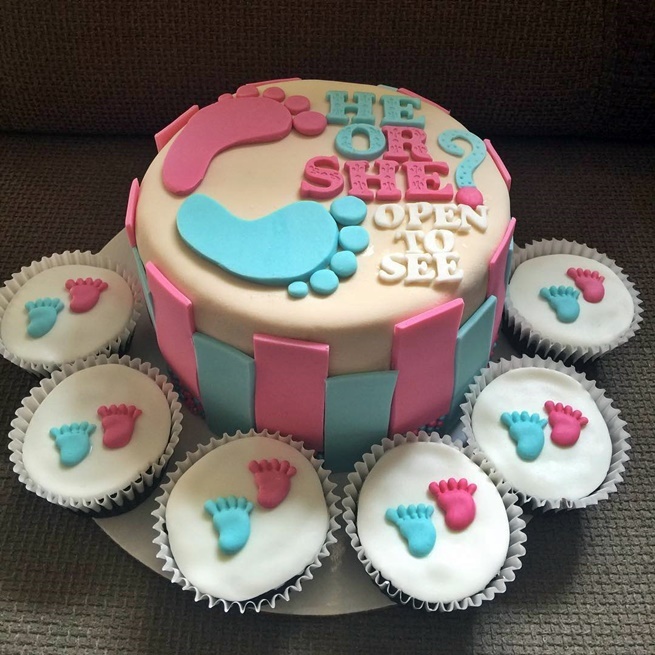 Are you looking for someone to make a custom cake for you or your loved one? Do you need a cake that would stand out? Leave a message with my cousin Karen and let her know that I sent you her way!